Legends of Tomorrow is not just a glittering joy bomb, but a TV anomaly for a couple of reasons. For one, it gets better with every new season, learning from its past mistakes and embracing a meta appreciation of its growth. Two, it’s a rare series that doesn’t associate being an “adult” show with darkness; it’s a superhero show that incorperates elements of horror and exceptional emotional stakes, and yet, is never bleak. It actually allows its cast to be adults — sexual beings even! — and fully embraces the idea that drama coming from joy and humor is no less potent than that which comes from violence or pain. It’s also a CW series that doesn’t focus on a single Big Bad to the detriment of its storytelling, rather, it organically incorperates seasonal themes while focusing first and foremost on the chemistry and daily routines of its characters. It’s also one of the most insane shows I’ve ever seen. Legends is now retuning for the second half of its fourth season after an extended winter break. Its first episode back picks up exactly where we left off, which is a little jarring (after a stupendously crazy “early this season” reel). But once you’re back in its world, there’s almost nothing better. The magical creatures that have defined an excellent fourth season so far continue to create great comedy as well as illuminate new facets of our leads. From a truth bug to love potions and a demon with extremely sinister designs, Legends uses its Creatures of the Week to help us get to know the Waverider crew even better, giving different characters each screentime in turn so we never tire of anyone, and no one is forgotten (and all are delightful — there is really not a weak link). As was true in the first half of the season, the team is no longer just sending the demons they capture to hell; some they are rehabilitating and adding to their motley crew, including a very savvy swap with Maisie Richardson-Sellers to reintroduce her as a new (and even more vibrant) character. And again, that’s something that sets Legends apart; the series, which started as a hodgepodge of favorite side-characters from the Arrowverse, has seen leads from its core cast come and go. Some of those were actors looking to move on, some were story choices. All of it adds up to a series that has actual stakes. It also keeps the dynamic of the team fresh, as new personalities find their fit — or don’t, and move on. What Legends never forgets (which is something that other Arrowverse series could learn, most especially The Flash), is that we’re invested in these characters outside of their missions. It reminds me of the end of The Avengers; so much fan art and fanfic (the good kind) was born out of that final shawarma stinger. Yes, them flexing their powers in overarching missions is fun thing to watch unfold on the big screen, but what fans were really taken with (as corny as it can sound) were the friendships. We wanted to see this group of misfits being casual together, something a movie doesn’t necessarily have time for, but a show like Legends can revel in — and does. In the three new episode of Legends’ 4B season available for review, those big narratives once again seamlessly weave in with the fun weekly cases to fix history and find magical creatures. But crucially, everything is based on character development. Villains are personal, and often change in their shading depending on each character’s relationship to them, leading to complex storytelling that is not dependent on one big moment. 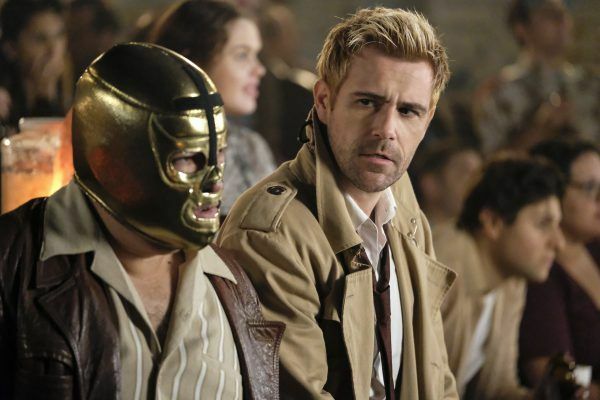 (Legends actually subverted that specifically when, earlier in the season, Constantine longed to sacrifice himself to save his lover Desmond — something that ended up being an empty gesture as far as the demon in question was concerned). And while the show does allow these emotional pauses amid its chaos, its chaos is also really, really fun. The less you know about the upcoming twists and jokes and reveals the better, but suffice it to say there are callbacks to Rory’s sci-fi book series, Zari and Gary potentially starting a crochet club, luchadores, one puppet sighting, a Bollywood number, and exchanges that only Legends can pull off. “We’ve lost the ship, drugged the President, and I’m stuck in the back with [this creature] …” Constantine complains. “And now we’re going to Disney World!” Sara replies. Because of course. Exactly because Legends is so enjoyable and unpredictable, there’s always a simmering fear that this brilliant and endlessly inventive show will run out of amazing, ridiculous, compelling stories to tell. But they haven’t yet, and with the series’ desire to always keep changing things up, innovating, and willing to take on whatever bonkers storylines suit them, that day may not come for a long time. They are the Legends of Tomorrow after all — enjoy today, and let them worry about the rest.